We need to train providers to have these difficult conversations, create health systems that flag patients with limited life expectancy who are receiving potentially harmful tests and interventions of little benefit, and educate the public about the harms of overtesting and overtreatment. Well, Alex and a bunch of us GeriPal’ers took this challenge to heart by creating a free ePrognosis: Cancer Screening decision support app to help guide conversations with elderly patients of whether to start, stop, or continue breast cancer and/or colorectal cancer screening. You can download it here for iPhones and iPads to try it out, or continuing reading to get a brief overview of what it does. When you start the app you’ll see the start screen asking you whether you are interested in screening for colorectal cancer, breast cancer, or both. Once you make a selection the app runs you through 15 health related questions including age, gender, BMI, symptoms, and functional impairment to calculate a mortality risk to estimate life expectancy. 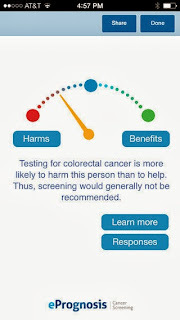 Based on the response to these questions, you will be shown a speedometer like image that can help inform whether cancer screening is more likely to help or harm a patient. You can also click on the "harms" or "benefits" buttons to learn more about what these may include. Lastly, you can also click the learn more button, which will run you through a series of pictographs (each pictograph is of 1,000 squares where each square represents one person). 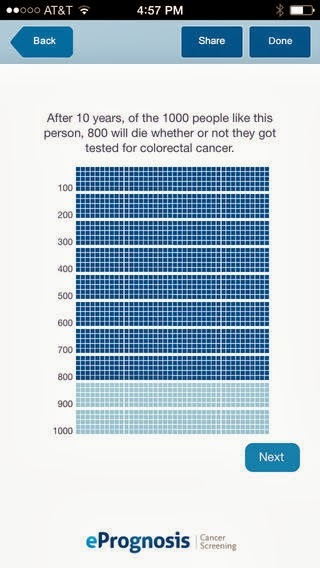 These pictographs visually display information on harms and mortality benefits from cancer screening, as well overall mortality risk at 10 years. 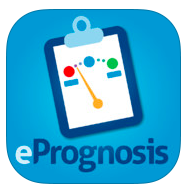 So give the ePrognosis app a try and tell us what you think. What works well? What can we do better? Comment below! I don't have the app in front of me, but when I've been communicating information, I've been trying to be flexible. Some patients think quantitatively but many think in value oriented terms and it is not obvious to some patients how to take the numbers and translate them into values. Sometimes it helps just to say them out loud. So for example, a colonoscopy is preventative measure that gives you no benefit now, takes years to see any benefit and the benefit is small. Many other interventions I have discussed with you are more likely to make an impact on your life, comfort and function now. 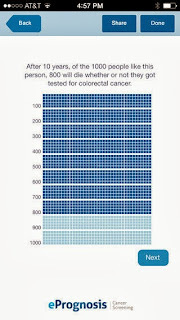 It is reasonable to want to decline a colonoscopy. If you want to pursue it, the risk of harm may be just as great as the chance of benefit but the most likely thing that will happen is just an annoying day of diarrhea. If you care enough about wanting to avoid cancer to the point you are willing to undergo a useless/harmful intervention then it is a good idea for you. If not, don't do it. 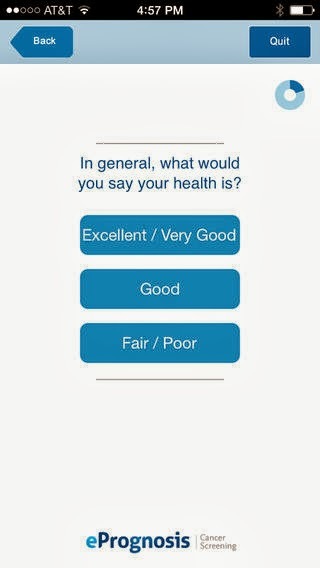 In other words, maybe some questions on values could help the app decide if it is a better fit. Goals (longevity, comfort, function), treatment preferences (curative, therapeutic, palliative, preventative, resuscitative). And the conclusion could have some recommendation of fit. Not sure if you want to get into that legally though. As we already now health Screening is the premise identification of unrecognized disease The main aim of screening, to be sure that as few as available with the disease get through undetected and as few as possible without the disease are subject to further diagnostic tests. 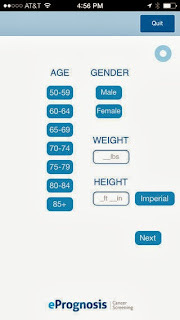 Is an Android or PC-based calculator available? 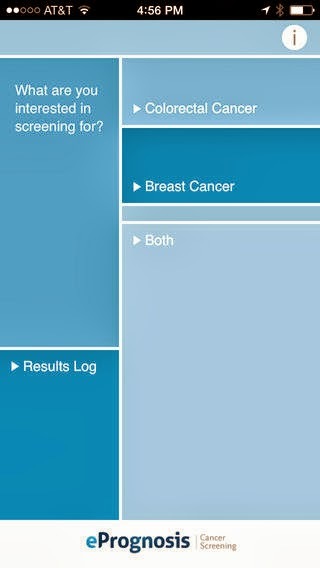 Is there an Android or web-based calculator for cancer screening available? We are working on it. Turns out that it costs a whole lot of money to develop apps for each operating system. Planning to use more of a web based system to avoid this.